I have been keeping track of weird news stories. My contention is that life is essentially weird. And the weird stuff that actually happens is sometimes weirder than what you would read in a story. I also wrote the other day about this question: Is science fiction dying? One possible answer: How can science fiction be dying when we quite obviously live in a science fiction world? (I know I answered a question with a question, but that comes naturally to the Irish.) Unfortunately, the science fiction world in which we live is too often a dystopia. A case in point: this week, a news story came out reporting that British hospitals have incinerated aborted and miscarried fetuses, in part to help heat their buildings. We all knew we were headed in this direction, but I didn't think it would happen so soon. Writers of science fiction and fantasy have anticipated developments like this, of course. It's equal parts "A Modest Proposal" by Jonathan Swift and Soylent Green, based on Harry Harrison's novel. It reminds me also of a cartoon by Andy Singer from his syndicated comic panel, No Exit, in which a man dashes through the background at a filling station shouting, "Soylent gas is made of people," while in the foreground, a man, who is gassing up his car, says, without even turning around, "Yeah, so what." So the story comes out about human fetuses being burned for heat, and the world says, "So what." I suppose such a thing is acceptable, even desirable, in our science fiction world. You might think at first that it would be unacceptable inasmuch as it contributes to global warming. We should all realize however that it is acceptable to burn human fetuses for heat because they have not yet reached the threshold of carbon neutrality. In other words, they are carbon negative, so burn, baby, burn. Disposing of them in any way is also acceptable because then we can help head off the sin of overpopulation, or in the words of Ebenezer Scrooge, "decrease the surplus population." Great! A twofer! There was record flooding in Great Britain this winter. That story came out first, so we can't place the two in a relationship of cause and effect. In any case, the last time we did stuff like this, the rains came and washed everything away--except Noah and the animals. So the British who endured inundation this winter get to relive it in a new science fiction movie called Noah. I know that the story of Noah and the flood comes from the Bible, but the movie bears little resemblance to that book. It is in no way biblical. Yeah, there is Noah and his family and a big boat full of animals and a worldwide flood, but otherwise Noah is on its own--pure Hollywood, if not Wormwood. Russell Crowe and Jennifer Connelly reprise their roles from A Beautiful Mind, only, instead of seeing mathematical equations in the sky, Noah sees visions of doom (some of which are drug-induced). She's still the devoted wife of a man who's trying to discover the meaning of existence. (She did the same thing as Charles Darwin's wife in Creation.) Anthony Hopkins plays Gandalf/Hannibal Lecter/Timothy Leary, but in this movie, he trades a taste for entrails for an obsession with red berries (no doubt slang for his favorite recreational drug). Oh, and there are Transformers, too. I can only assume that Noah is set in a dystopian future with some elements of an imagined past, a sort of Lord of the Rings meets Mad Max. Humanity once again gets wiped out for its wickedness, but there doesn't seem to be much wickedness going on except for eating of cute little animals. And for being a bunch of hungry people, they sure look well fed. Maybe they have been drinking too many Big Gulp sodas. In any case, the suggestion seems to be that it has all come about because of that pesky global warming and overpopulation, you know, the only two sins left in the world. (I guess you can add a third when Tubal-Cain, the Bob Hoskins character, partakes of some salamander sushi, thereby rendering a species extinct.) In the end, everybody learns a lesson, Noah puts his drunkenness behind him through a twelve-step program, and the world goes on. So I wouldn't lose any sleep over Noah. But before you turn in, make sure you turn off your carbon-neutral, fetus-powered, non-incandescent electric light, and if necessary, take a red berry for a nice, dreamless sleep. When I was a child, I read the Childhood of Famous Americans series published by the Bobbs-Merrill Company. I owned just one volume in the series, Patrick Henry: Boy Spokesman by Thomas Frank Barton (1960). It's here in front of me as I write. Bobbs-Merrill was based in Indianapolis; several of the authors and artists who contributed to the series were Hoosiers, including Augusta Stevenson, Guernsey Van Riper, Jr., Clotilde Embree Funk, and Jean Brown Wagoner, who was the grandmother of my classmate Mary. (Our local branch of the Indianapolis Public Library was named for Jean Wagoner's father, Hilton U. Brown.) I have always loved history and biography. The connection between the Childhood of Famous Americans series and my home city may have enforced those feelings, and the connection may have been a source of some small pride to me as a Hoosier and an Indianapolitan. So I read the series, especially the books on soldiers, explorers, and our founding fathers. I also remember the biographies of Annie Oakley and Lou Gehrig. But even as a child, I wondered, "How did the authors know what the characters in their books did and said as children?" The answer didn't come to me until later. Maybe childhood ends in these small increments. In any case, I came to know the answer to my question: The authors didn't know, they made it up, their stories perhaps based in fact, but still mostly made up. That's one thing for a fictionalized biography for children. It's quite another for a supposedly scholarly work for adults. But that's what L. Spague de Camp and his co-authors did in Dark Valley Destiny, a limited-edition biography of Robert E. Howard published in 1983: They made it up. And not a single quote or note to support any of it. I'm reminded of an elementary lesson in composition: Don't tell it, show it. De Camp and company are guilty of other sins and omissions, a chief one being that they don't tell about the reaction to Howard's suicide among his correspondent-friends, especially H. P. Lovecraft, and his many admiring readers. Another is that Howard's friend, Novalyne Price, simply wanders out of the story, never to return. The book picks up the pace after getting Howard through his childhood, but by then it's too late. It has become a lost cause. I bought it and will keep it, but it's a book only for the completist, I think. 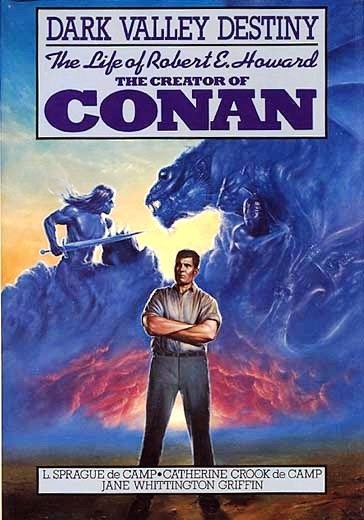 I'm sure there are better biographies of Robert E. Howard, and if not, one might easily be written. The cover of Dark Valley Destiny: The Life of Robert E. Howard by L. Sprague de Camp, Catherine Crook de Camp, and Jane Whittington Griffin, published by Blue Jay Books in 1983 in an admittedly fine edition, with a slipcase, dust jacket, illustrated endpapers, and bound-in bookmark. The cover illustration is by Kevin Eugene Johnson. It isn't often that an obscure collection of stories from the nineteenth century draws the attention of twenty-first century television viewers, but such a thing has happened. The collection is The King in Yellow by Robert W. Chambers, from 1895. The television viewers are the people who watched the HBO series True Detective, which premiered on January 12, 2014, and ended its first run on March 9. I say "obscure," but fans of fantasy fiction and weird fiction are and have been well acquainted with The King in Yellow for a long, long time, since H.P. Lovecraft wrote about it in his seminal study, "Supernatural Horror in Literature" (1927), if not before. I regret to say that I haven't seen the show, but I would like to have a look. The creator of True Detective is Nic Pizzolatto, a writer and teacher from New Orleans. I'm happy to say that Mr. Pizzolatto has a connection to my home state of Indiana, for he taught at DePauw University in Greencastle, only a few blocks away from where I used to live. DePauw also gave us John Jakes, creator of Brak the Barbarian and countless other genre characters. Nic Pizzolatto seems to be pretty familiar with genre fiction himself. His TV show is named after a pulp magazine first published by Bernarr Macfadden in 1924--ninety years ago this year. He has drawn on The King in Yellow in his plotting and writing for his show, which is set in the author's native Louisiana, the same country haunted by the cult of Cthulhu in Lovecraft's "Call of Cthulhu." One of the characters in that story is--like Mr. Pizzolatto's protagonists--a Louisiana detective, John Raymond Lagrasse. Lovecraft's fictional grimoire, The Necronomicon, doesn't make an appearance in "The Call of Cthulhu," but Lovecraft may very well have based the idea of a book that drives men mad upon reading it on Robert W. Chambers' fictional drama "The King in Yellow." In any case, I wish Mr. Pizzolatto and the makers of his show further success. Lucille Webster was born on December 8, 1900, in Valparaiso, Indiana. Her father, George A. Webster (1854-1924), was a Canadian-born photographer. Her mother was Nellie Carpenter Webster (1862-1951). As a child, Lucille lived with her parents and her older sister in Bloomfield, Indiana, and in Chicago. She studied at the Art Institute of Chicago and shared a studio with her sister, Mildred. Lucille Webster married another artist, Holling Clancy Holling (1900-1973), in 1925, the same year in which he legally acquired his new name. Born Holling Allison Clancy in Holling Corners, Michigan, Holling graduated from the Art Institute of Chicago and worked in taxidermy at the Field Museum of Natural History in Chicago. He also studied with anthropologist Ralph Linton. Together Holling Clancy Holling and his new wife Lucille Holling set out on an adventure in 1926-1927 with the first University World Cruise, sponsored by New York University. Lucille designed scenery and costumes for the drama department while her husband served as a shipboard instructor of art. There would be many more travels to come. 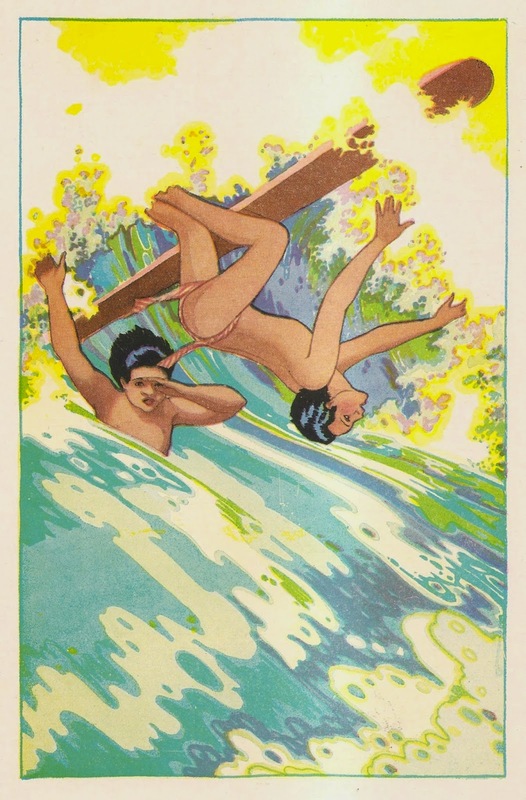 Lucille Holling and her husband worked in advertising and as commercial artists and illustrators. In addition to drawing fashion illustrations, Lucille Webster Holling illustrated Kimo: The Whistling Boy by Alice Cooper Bailey (1928), Wedding of the Paper Dolls (a coloring book, 1935), and Songs from Around a Toadstool Table by Rowena Bastin Bennett (1937). 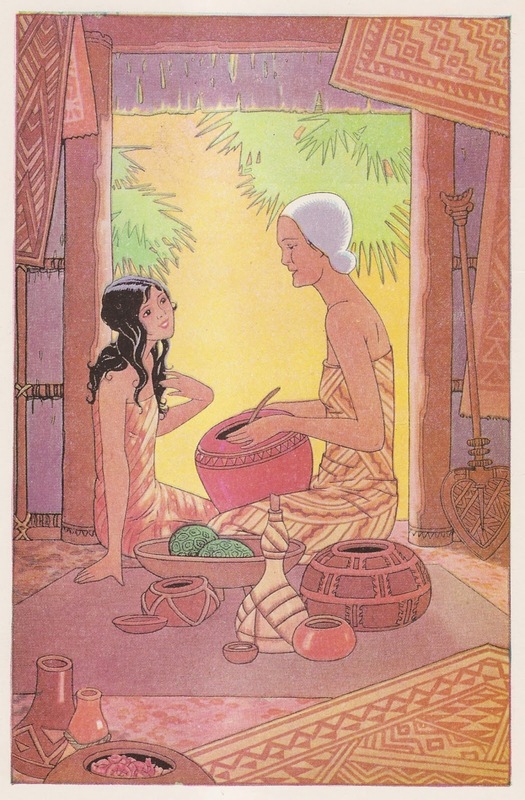 She also contributed a cover illustration--one of the finest--to the pulp magazine Oriental Stories (later called The Magic Carpet Magazine) in Autumn 1931. Holling Clancy Holling is renowned for his many beautifully illustrated children's books. Less well known is the fact that his wife assisted him on several of them, including Roll Away Twins (1927), Choo-Me-Shoo the Eskimo (1928), The Book of Indians (1935), The Book of Cowboys (1936), Little Buffalo Boy (1939), and Pagoo (1957). The couple also illustrated Road in Storyland (1932) and The Magic Story Tree (1964). The Hollings lived in southern California as early as 1930. In 1951, Lucille Holling designed and oversaw the construction of their home and studio in Pasadena. Holling Clancy Holling, a jack-of-all-trades and a man well worthy of his own written biography, died on September 7, 1973. His wife survived him by more than a decade. Lucille Webster Holling died on December 31, 1989, in Verdugo City, California, at age eighty-nine. For further reading, see the blog devoted to Holling Clancy Holling, called, conveniently enough, "Holling Clancy Holling," here. There is or was also a museum devoted to him in Leslie, Michigan. The Hollings' papers are at UCLA and the University of Oregon. Two illustrations by Lucille Webster Holling from Kimo: The Whistling Boy by Alice Cooper Bailey (1928). Incidentally, an illustration I posted previously on my Indiana Illustrators and Hoosier Cartoonists blog, drawn by Lucille and showing a biplane over a tropical coastline (at this link), is also from this book. It may or may not have been used as a travel poster. 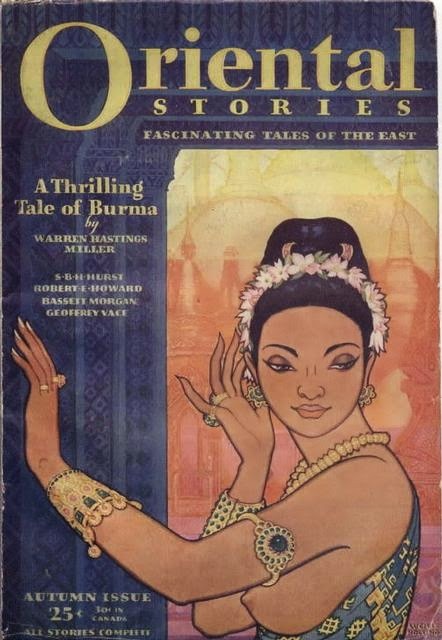 Lucille Holling's lone cover for Oriental Stories (Autumn 1931) and perhaps her only pulp magazine cover. She would very likely have outclassed many in that field. 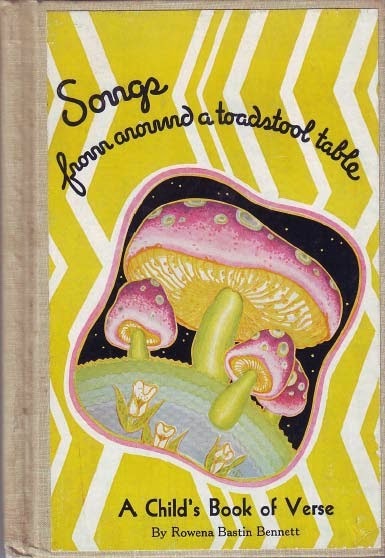 Finally, the cover of Songs from Around a Toadstool Table by Rowena Bastin Bennett (1937), drawn by Lucille Webster Holling. Update (August 28, 2018): I have heard from David Saunders, son of the pulp artist Norm Saunders and author of the website Field Guide to Wild American Pulp Artists. Mr. Saunders has just recently completed a biography of Matt Fox. You can read it by clicking here. In reading David Saunders' biography, I find that my speculations on Matt Fox are just plain wrong. I've lined through those parts below. I plan on completing this two-part series on Matt Fox at a later date. In the meantime, I ask that the anonymous commenter (below) who has photographs of Matt Fox contact me, as David Saunders is interested in posting a photo on his website. Little is known of Matt Fox. Most of what you'll find on the Internet is recycled from one or two sources. The Wikipedia entry is cribbed from Art in Time: Unknown Comic Book Adventures, 1940-1980 by Dan Nodel (2010). To its credit, The Internet Speculative Fiction Database lists Fox's birthdate, birthplace, and death date. At least somebody somewhere did some original research. The Connecticut Death Index says he never married. If that's the case, it's unlikely that he had children. Matt Fox may very well have died alone, as is the fate of so many artists, including Hugh Rankin, Hannes Bok, and Wally Wood. There may not have been anyone to carry on his memory. Fortunately, we are beginning to remember him now. I know this much: Matt Fox was born on November 8, 1906, in New York City. I'm afraid I can't confirm the names of his parents, although I have candidates. The best candidates I have found were residents of Atlantic City, New Jersey. On a blog called Potrzebie, the author, named Bhob, recalls meeting Matt Fox in North Bergen, New Jersey, at the home of Calvin Beck, publisher of the magazine Castle of Frankenstein. That was in the mid-1960s. If North Bergen was close to home for Matt Fox, then maybe he was the same Matt Fox enumerated in the U.S. Census in Atlantic City in 1910, 1930, and 1940. If they were one in the same, then Matt Fox the artist was the son of Matthew Fox, Sr., a bricklayer, and his wife, named Fannie. And, if the same Matt Fox was living in Atlantic City in 1940 and working as a painter, then he was married after all. His wife was named Kathleen. The asterisk indicates that Fox wrote the entry himself. (P = pencils, i = inks, s-f = science fiction.) That may be as much as what is generally known of Matt Fox. Matt Fox served eleven months in the U.S. Army, from January 13 to December 13, 1943. According to The Internet Speculative Fiction Database, Fox's first drawings in the genres of fantasy and science fiction were published during those eleven months. They included his first interior illustration for Weird Tales, in March 1943. His first cover followed a year and a half later, in November 1944, just in time for Fox's thirty-eighth birthday. (1) Like so many artists before him, Fletcher Hanks died alone. His frozen body was found on a park bench in New York City. Weird Tales, November 1946. Cover story: "Spawn of the Green Abyss" by C. Hall Thompson. Cover art by Boris Dolgov. 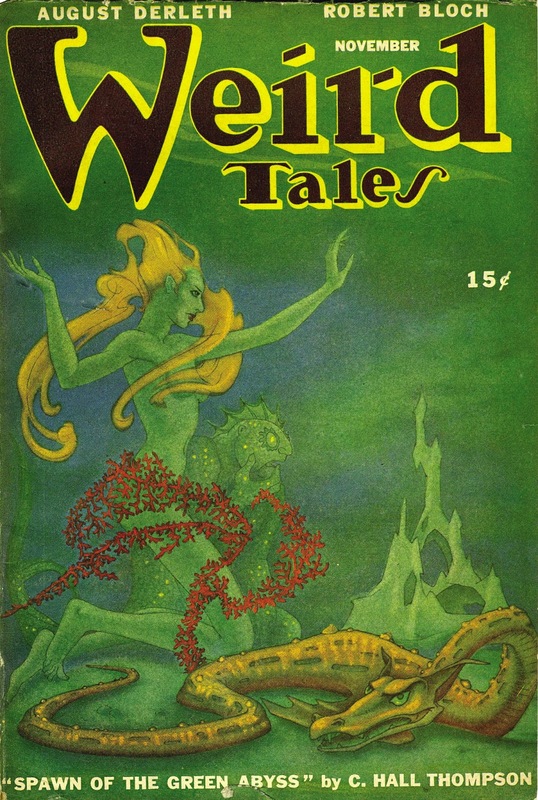 Only two covers of Weird Tales showed underwater scenes. Both were by Boris Dolgov. This was the first. It was also Dolgov's first cover for the magazine and no easy feat at that. If I guess correctly, the original art was a pencil drawing tinted with watercolors. It must have been delicate and not easily reproduced. Weird Tales, January 1948. 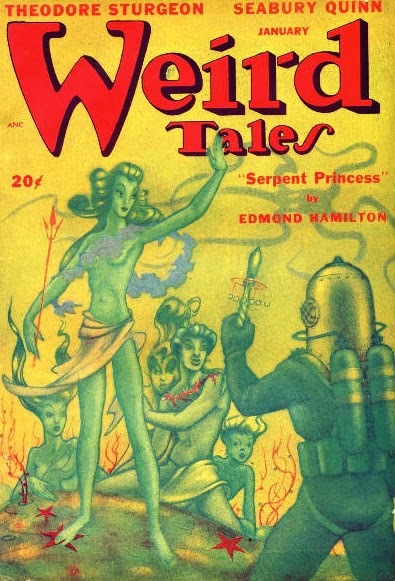 Cover story: "Serpent Princess" by Edmond Hamilton. Cover art by Boris Dolgov. Another delicate and not easily reproducible drawing by Dolgov. Note the red decorations in both scenes. A couple of weeks ago, I heard someone ask a question that I had never before heard anyone ask: Is science fiction dying? So I did what we all do in this age of digidiocy: I Googled it. Even before I finished typing out my search words, Google had the question for me, ready and waiting. Evidently I wasn't the first person to pose it. Today I asked Google again and got back 21,000 results. So, no, I'm not the first. I had never before thought to ask: Is science fiction dying? I didn't even know it was sick. After all, we live in a science fiction world. Everybody and his brother is carrying around a communicator, like Captain Kirk. (The difference is that Captain Kirk put his communicator away occasionally. He had plenty of outer-space babes in sparkling outfits to look at--he didn't need an electronic binky to keep him happy.) And, like on Star Trek, we're all enslaved--or at least made mindless--by our computers. We could probably use some rescuing from our machines in the same way the captain and his crew saved so many extraterrestrial civilizations from theirs. And how can science fiction be dying when every movie and every TV show is science fiction or has science-fictional elements? Some people are even asking: Is science fiction dead? Not just dying, but already dead. So I guess these are serious questions, and people have reason to address them. I guess I'll weigh in, too. So I asked the question and read through a few articles addressing whether science fiction is dying. The oldest article was from 1993, so if science fiction is dying, it has been at it for a long time. My first thought was that nothing could take twenty years to die, but then I have to remember that some things, the Roman Empire for example, hang on for decades or centuries before giving up the ghost. Most people who have asked themselves this question seem to think the answer is: Yes, science fiction is dying. Not being an expert, I can't say. But even before I heard the question, I was thinking of the flying saucer phenomenon, which is of course an outgrowth of science fiction, and I realized that flying saucers are not only dying, they are dead, dead, dead. At one time, some serious and respectable people were willing to believe in them, perhaps for good reason. No more. That's not to say that people have come to their senses; instead, they have simply transferred their belief in flying saucers to wacky beliefs in other things. I won't give any examples. The problem with this question and with similar questions from fans of science fiction and fantasy is that they have separated the question from the wider culture. What I mean is that, if you're going to ask the question, "Is science fiction dying? ", then you should understand that dying is a part of the history of every living thing, every organization, every institution. Although science fiction originated before World War II, it flourished only after the war when science-fictional ideas seemed ready to leap out of the pulps and into real life. I think the war helped in that. After all, we suddenly had atomic bombs, rockets, radar, jet power, pressurized cabins and suits, faster-than-sound travel, and on and on. In a few short years, there would be hydrogen bombs, atomic power, artificial satellites, and men in space. Science fiction became real in the postwar world. For people other than fans, science fiction was new. Other things were new in the postwar world, too--and a lot of them are dead, dying, or pretty darned sick. If science fiction is dying, it may be only because so many aspects of postwar culture are at or near their end. Here I will give some examples: men's adventure magazines; paperback books of a certain type; the Golden Age of Heterosexuality; youth culture; the culture of hot rods, custom wheels, drag racing, and muscle cars; homogeneous habits of watching television (three networks have given way to a gazillion); bebop and cool jazz; the culture of the road, of traveling, camping, hitchhiking, and so on. And what about rock-and-roll, soul, and rhythm-and-blues? If these things are not dead yet, they seem to have one foot in the grave and maybe the other on a banana peel. The larger question it seems to me is not, "Is science fiction dying? ", but this: Are postwar culture and all of its great and wonderful aspects dying? And if so, how soon will it be before they are in their graves? I don't like the likely answers.